Learn how to journal your way to God’s heart and enrich your passion for writing. Discover how the lessons God gives you day to day, year to year, can help you develop your book ideas, articles, devotions, and poetry. You don’t have to be a stand-up comic to win with humor. Whatever you are writing—fiction, nonfiction, how-to articles, blog posts, stand-up comedy, sermons or speeches—humor keeps readers engaged and on your side. The author of a dozen humorous, inspirational books for women, Karen has also written a humor column for Women of Faith, and was named “The queen of good humor and common sense” by The Literary Guild. Join her as she shares inside secrets to delighting your reader with humor, regardless of your style or genre. The art of researching and writing historical fiction, memoirs, or biographies including tough questions such as what to include and exclude when writing about the past. It is not likely that we will survive this life without being wounded by adversity. In fact it is our adversity that truly shapes our character and best equips us to step into the brokenness of others to bring them comfort, hope, and healing. “We may be able to comfort those who are in any trouble, with the comfort with which we ourselves are comforted by God” (1 Corinthians 1:4 NKJV). 1E – Does My Writing Offend You? The number of books about ethnic characters has risen over the last few years. From 10 percent in 2013, more than a quarter of young adult and children’s books featured characters of color in 2016. Sensitivity readers are not the police of free speech or intend-to-be censors. They are readers who review manuscripts for issues of bias, issues of representation, cultural inaccuracies, and insensitive language, Will your work pass their scrutiny? Authors, indie published or traditionally published, feel stretched. Funds are limited. They are only one human. And they have three months to prepare and kick things off with a new book to capture readers. What should be included on your marketing list? What is best for authors to pay for or create on their own? As an agent and now author, I’ll share what I’ve seen with clients and my own experience of what can be left off but what is essential to launch a book well and keep it out there for more than launch week. We’ll look at timelines and tips to help your wallet and your time. Christian writers can prepare believers to advance the kingdom of God as America takes another step toward complete rejection of its Judeo-Christian roots. Some shoulds and should nots and that’s-the-way-it-is declarations are at best half-truths far too many writers obey to their detriment. We’ll expose several of these myths so you can write more freely and get published more frequently. Learn how to draw a young audience into your story through an introductory hook. You will learn the basics of writing for young children and preteens, how to determine your audience’s age, and how to develop characters and plots, as time allows. This class is all about digging deep to find the truth in your fiction and how to tell it in a way that resonates without being preachy. We'll examine plot/characters according to Bible stories as well as novels and movies, dissecting the stories that have had the most impact on us to better craft our message for the world. We will explore why social media platforms are essential to building your brand as an author and what publishing professionals look for specifically. Are you afraid to engage? In today’s world, traditional principles provoke reactions that can be unfair and personal. But the incredible shrinking Christian writer does the world no good. Let’s learn to write truth! God’s Word changes lives. Knowing how to rightly handle the Word of Truth enables you to change lives without being misguided, mistaken, or manipulative. Michael will help you steer clear of common word study mistakes, interpretation errors and logical fallacies. He’ll also explain the differences in Bible translations and review software and websites that will help you dig deeper into God’s Word. The good news is, you don’t need to be a seminary graduate to incorporate God’s life-changing word into your writing! Are you tired of coming up with the same old hum-drum ideas? Do your editors reject your ideas for being too run-of-the-mill? It's time to start thinking creatively! Learn new techniques to come up with blog ideas. Come prepared to challenge your brain by thinking in a different way. Warning: you may come out of this workshop with so many ideas that you won't know which one to write first! Craft believable characters by delving into human emotions, personality traits, quirks, and disorders. Learn to build an accurate, intriguing human psyche from a practicing therapist. Story—what a wonderful tool! Story connects emotionally with readers and illustrates our message in a visual way. We might use story as a beginning hook or to reinforce points throughout our writing. When discussing an especially tense subject, a humorous story provides welcome relief. And ending with a story is an enjoyable and memorable way to wrap up what we have to say. This workshop will introduce you to valuable fiction skills you can use IMMEDIATELY to successfully further your nonfiction! Develop a unique brand that will powerfully capture the marketplace by applying the “umbrella branding” approach to every aspect of your writing career. No one wants to hear about you and your book after the third week of your book's release, so how do you market your book without talking about your book? Come learn the proven strategy that turns marketing into ministry AND that sells books. The foundation of every contemporary crisis is Death, abortion, homosexuality, divorce, abuse, drugs … all wage war on procreation , the family. How can we redeem Truth and Life to this generation. The “Imposter Phenomenon” is defined as the inability of high achieving people to internalize their successes or to believe that they are capable of or responsible for their accomplishments. Imposters feel like frauds—plain and simple. Learn from a “recovering imposter” how to overcome unwarranted fears and insecurities in order to flourish. Voice is style, plus theme, plus personal observations, plus passion, plus belief, plus desire. Voice is bleeding onto the page, and it can be a powerful, frightening, naked experience. In this session, we will address techniques to help you developing your writer’s voice. Looks at how we can and do use our past experiences, pain, and unresolved emotional issues in our writing to provide healing and hope as well as a cathartic outlet. Accelerate your writing career by tapping into the ideal professional speaking organizations, resources, and tools. Come learn the inside secrets every Christian writer needs to know about the world of public speaking. Antagonism toward the Christian faith and believers is at a new high in American culture. Find out how you can answer Christianity’s critics and win their respect while building the confidence of believers. We leave many footprints as we travel through life--ink, sand, carbon, dirt, digital, wandering, grass-stained, spinning, and spiritual to name a few. In this workshop we will explore the spiritual footprints from our hearts, through our books and articles, to our readers’ hearts. Since writing tight is the hallmark of a consummate professional, then the shorter the work, the greater the craftsmanship required. This means that writing excellent poetry is the greatest possible challenge and that mastering this skill will strengthen our prose as well. Designed for those who love poetry and would like to start writing it and for those who have started but haven’t yet published, this workshop will begin by defining poetry (so we can recognize it when we see it). Then we'll discuss the unique potential of poetry and how to tell good poetry from bad. Most important, we’ll talk about how to write excellent poetry. What constitutes an inspirational romance, and how far can a Christian writer realistically go with the romance between a man and a woman? Focus on the Family has a wide audience and a range of publications to match. Come learn about them and find out which is the best fit for you! Don’t leave the conference without a plan or goals. Learn how to continue taking advantage of the conference long after it ends. Do you have what it takes to host a FB Live program? You can simply activate the “Go Live” button and share from your heart. Or you can host a regularly scheduled program and become a trusted resource for your target market (particularly useful for pastors and ministry leaders). But why bother in the first place? Because Facebook “pushes” a FB Live post out to more people than any other type of post, so if you’re looking for organic marketing (meaning no paid ads! ), a FB Live program might be your answer. You’ll leave this class with the 5 foundational answers needed to host any successful FB Live program. There are some who see what others do not see, hear sounds others do not hear, and discern danger before danger reveals itself. Should he sleep, the loss of the city will stain his hands forever. Discover exciting ways your writing can springboard into other methods of sharing the message God has called you to deliver. Discover the things that will destroy your writing. Five key strategies to make our characters walk off the page. Why do you write? What is the message God has put on your heart? Who needs to hear it? No book (other than the Bible) is for everyone. Discover how to write to your reader to expand your reach. Have you written an article that can’t seem to make it to publication? Is there something wrong, but you’re not sure what it is? Bring your manuscript to this workshop. We’ll go through a checklist of what an article should contain. You can critique your own work right in class and come away with specifics on how to improve it so it catches an editor’s eye. Alternatives to what? Traditional publishing. Hear from the author of 74 printed books, who nevertheless enthusiastically thrives on blogs, web magazines, and networking to Write His Answer, and even generate income. 6G – Make Some Noise! Paul Revere’s night ride of 1775 rallied the Colonists. Christian writers are also night “writers” upon their keyboards to awaken God's army. A Shadow Agenda seeks to discourage us, but Bruce sees only inevitable victory in Christ. 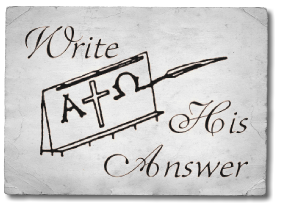 He encourages God's heralds to “Write His Message” of Christ's final ultimate victory over the Shadow Agenda!